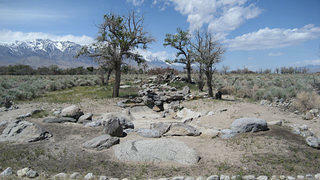 There are many gardens at Manzanar National Historic Site. 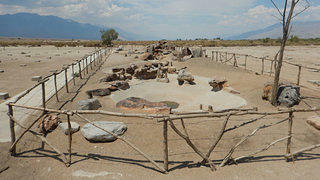 Some are along the driving tour route and are easy to spot by visitors to this desert landmark. Others are buried beneath layers of sand and debris. Some are simple rock formations, and others are elaborately designed landscapes, with ponds, bridges, streams, and fences. Together, these gardens—one of the most important collections of Japanese gardens in the country—stand as symbols of resistance and resilience. 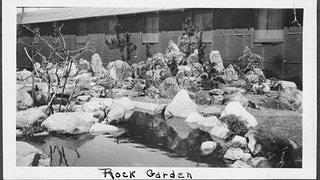 Built in the summer of 1942, the Block 6 mess hall garden included a cobblestone sidewalk, wooden fence, mounds, ponds, and two rocky islands. Today, the Block 6 mess hall garden is covered with sand, debris, and leaf litter. Flood deposits have buried the garden’s ponds. The Block 12 mess hall garden was completed in the summer of 1943. This photo is of Block 12 after restoration. The east entry to the Block 12 mess hall garden. 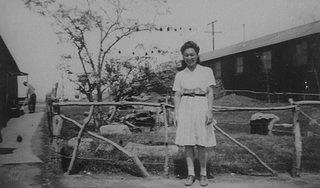 They were created by the Japanese-Americans who were confined at Manzanar War Relocation Center in the 1940s. 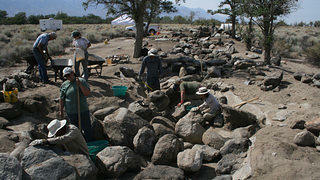 It’s estimated that there were, at one point, more than 100 gardens inside the fences and underneath the guard towers at this 814-acre site in eastern California’s Owens Valley. The men and women held there built the gardens between the rows of barracks, outside the mess halls, and along the firebreaks, as a way to improve living conditions and add beauty and hope to the desolate prison landscape. The gardens also created communal spaces for those interned at the center. They were places for children to play and for families to gather. A 2013 excavation of the Block 17 Barracks 8 garden uncovered a pond with large rocks and faux-wood concrete logs. The Block 9 mess hall garden was excavated and stabilized in 2007. 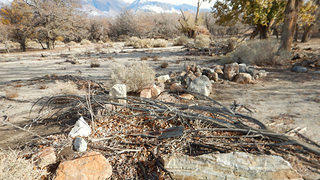 As part of the 2007 excavation and stabilization of the Block 9 mess hall garden, displaced boulders were re-set and a faux-wood log was repaired. The most common gardens were small plots outside of the barracks apartments, typically near the entrances. The first such garden began on April 19, 1942, less than a month after the camp opened. 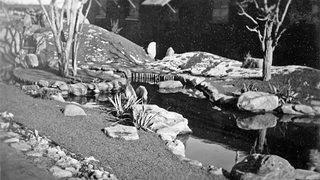 It was the design of Southern California landscaper William Katsuki, who created the garden outside his barracks in Block 24. 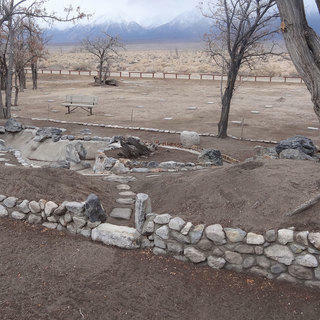 By October 1942, there were so many gardens throughout Manzanar that the Manzanar Free Press held a garden contest, which is believed to have spurred even more gardens. 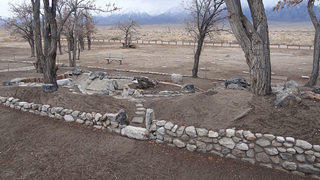 After Manzanar closed in 1945, many of the gardens were bulldozed or buried along with most of the other buildings at the center. Debris, sand, and silt covered the ponds, and vegetation grew over the site. When the National Park Service conducted an archaeological survey in 1993, only a few of the biggest gardens were still visible. The Block 9 mess hall garden, as seen before its 2007 excavation and stabilization. More than 20 cubic meters of sediments were removed from the Block 9 mess hall garden, revealing a winding stream and two ponds. 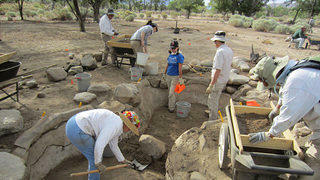 An archaeological excavation in 2007 uncovered remains of the fence around the Block 34 mess hall garden, which was accurately reconstructed. 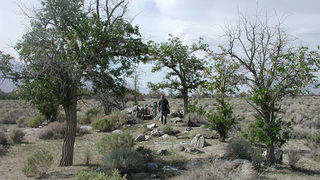 Since then, Jeff Burton, an archaeologist at Manzanar National Historic Site, and his team have worked to uncover the gardens. Using newspaper accounts, oral histories, photographs, consultations with Japanese garden experts, and archaeological excavations, Burton and his crew—many of whom are volunteers—are finding and, in some cases, restoring or recreating the gardens. 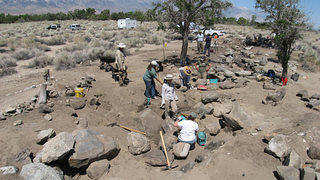 So far, 20 have been excavated, mapped, and stabilized. A management plan for the gardens is currently in the works, and will outline how they will be researched, restored, maintained, and interpreted in the coming years. Some gardens will be preserved as-is, kept in their state of abandonment to show the harsh desert conditions faced by those who were confined at the site. Others have been or will be brought back to the way they looked in the 1940s. For more information on preservation projects at Manzanar and other sites of conscience (places with difficult histories), don’t miss the Fall 2015 issue of Preservation magazine. 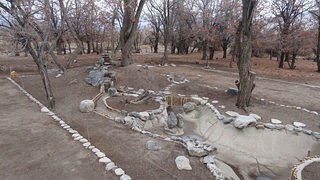 The elaborate Block 34 mess hall garden won first place in the Manzanar Free Press garden contest in November 1942.